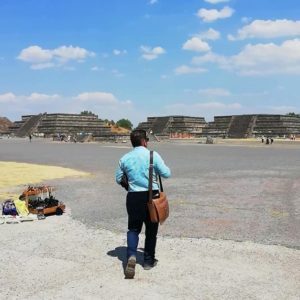 For those of you that haven’t had the chance to do a bit of reading about Mexico’s history and culture; Teotihuacan is a UNESCO world heritage site about 50km out of Mexico City. It is one of many archaeological sites in Mexico that includes the ruins of an ancient civilization and some magnificent pyramids. We went to the pyramids on a hot spring afternoon after a factory visit and were lucky enough to have the benefit of our own *English-speaking* tour guide to give us some insight into what we were seeing. At its height (ca. 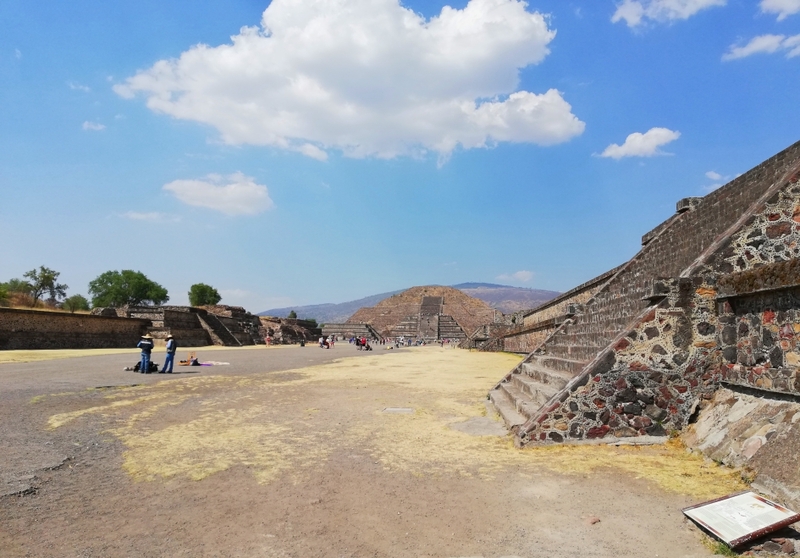 500 CE), Teotihuacan was one of the biggest cities in the world with up to 200 000 occupants that were led spiritually and politically from the “Avenue of the Dead”. The name is misleading as those who discovered the ruins of the pyramids believed them to be burial sites. However, some of them had actually been housing complexes for important people such as priests, doctors and teachers and others were temples for different gods. The Avenue of the Dead – looking back towards the Pyramid of the Moon. If you look carefully, you can see how the Pyramid of the Moon mirrors the mountain behind it. The largest pyramids are the Pyramid of the Sun and the Pyramid of the Moon. They are equally as high, although the Pyramid of the Sun is bigger as it is at a lower elevation. 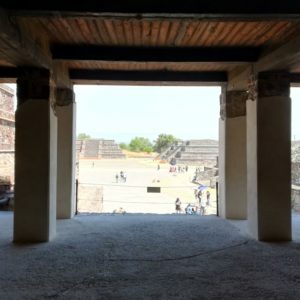 The balance of the heights of the two pyramids is considered to fit in with the culture of the people that lived in Teotihuacan as they valued balance in all things. They valued the moon and the sun equally, they allocated specific years for male and specific years for female leadership and even in their artwork they used both male and female forms. 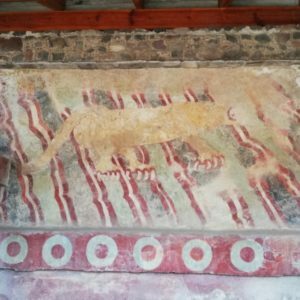 For example, there are a lot of images of jaguars around which was a male representation but you also find the image of the puma which was considered a female representation. 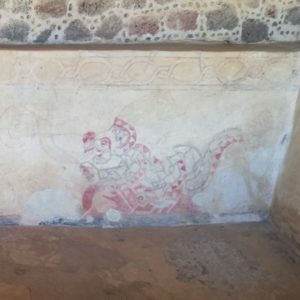 One of the representations of the jaguar. A representation of the puma. It was awe-inspiring to see the carvings and murals that these ancient people had created from simple, natural materials such as obsidian (a hard glass-like rock used to carve into softer stones), iron oxides (used for red paint) and turquoise (used for green paint). Everything had been meticulously considered by these ancient people – even the height of the steps on the pyramids of the gods. They are just short enough to force you to keep your head bowed as you ascend to the gods which, not only makes you more contemplative as you climb, but also brings those of us that are a bit more unfit closer to the gods as you tend to start to worry about a heart attack by the time you’re nearing the top. The views are worth the climbs though. 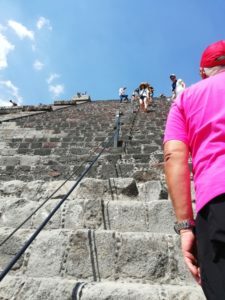 Plus, as an extra bonus, if you stand at the top of the Pyramid of the Sun – right at the centre point – the theory is that you will absorb some of the sun’s energy. The view from the Pyramid of the Moon – looking down over the Avenue of the Dead. Notice how the Pyramid of the Sun mirrors the mountain behind it. 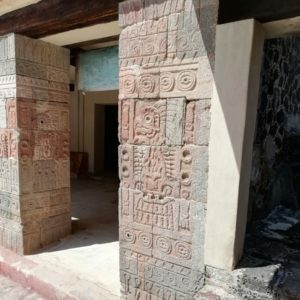 It was really special to have the opportunity to see and experience some of the remnants of a culture even older than the Aztecs themselves and we were also lucky enough to get to see some examples of more modern Mexican culture and history. That is what I will share with you next.